WATKINS - For much of the season, runs have been scarce for the Watkins Mud Hens. 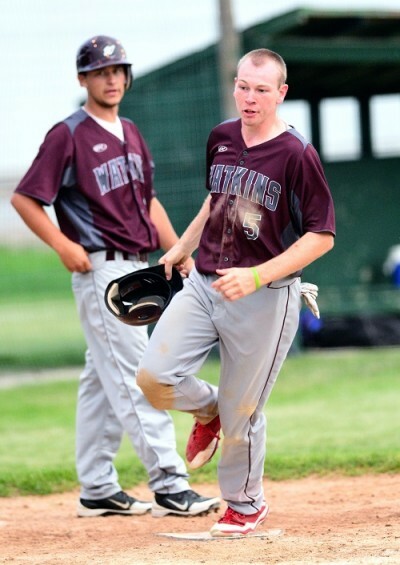 Outside of a sweep of Norway in week two, Watkins had not dented the win column in Iowa Valley League play. It appeared the Mud Hens were on their way to more of the same here Sunday against Walford. The Hogs got a two-out RBI double in the bottom of the ninth from Tyler Butz to top the hosts, 2-1, in the first game. Then it was Butz again getting Walford out to a 2-0 lead in the first inning with a two-run double and it looked like the Hens were headed to their sixth straight defeat and two more setbacks. However, from that point on Watkins starter Evan Boddicker closed the door the rest of the way, allowing just three singles and his teammates scratched across two runs in the bottom of the sixth to secure a 3-2 win and a split at Gabe Kuester Memorial Ball Park. "I really didn't change anything out there after the first inning," said Boddicker, who pitched at Mount Mercy. "I just kept my same approach and really just tried to keep us in it." Watkins (3-7) has scored a total of eight runs in its seven losses. The winning rally in the nightcap was small-ball all the way. Trailing 2-1 entering the bottom of the sixth, the Hens' Skylar Frese got it started with a walk and moved to second on a Karson Kuester sacrifice bunt. Chris Krystowiak reached on an infield single, moving Frese to third. Brady Kraus' ground-out to first scored Frese with the tying run. The eventual winning tally came when, on a short wild pitch, Walford catcher Jake Stenberg tried to nail Krystowiak taking third, but his throw got away, allowing Krystowiak to trot home. Boddicker then retired Walford in order to seal the victory. "It was really a relief to get those runs across," Boddicker said. "I was just ready to go back out and shut them down and that is what I did." Outfielder Jake Farley, who had two of the four Watkins hits in Game 2, was happy to come away with the split. "We just hung in there," he said. "We've been close in a lot of games. This was a good one to get." Boddicker allowed six hits overall, striking out seven and walking just two. The opener was a battle of the pitching staffs. 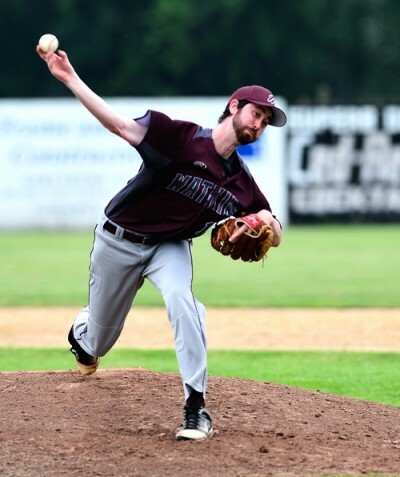 Frese relieved veteran Hens' lefty Luke Franzenburg to start the fifth and allowed only two hits over the final five innings, but both came in the ninth, capped by Butz's ringing double to the fence in left. Mitch Moser came on in the sixth and got out of a bases-loaded jam to keep the game tied. He allowed only an infield single over the final 3 2/3 innings to pick up the victory for Walford (5-5). Both teams hit the road to open the second half of the league season in 1 p.m. doubleheaders next Sunday. Watkins will travel to Williamsburg while Walford will meet the Stars at Mount Mercy.